G7 drive performance makes it the ideal drive for high performance speed, torque, or position control applications. Several control modes are provided. In open loop vector mode, the latest flux observer algorithms extend speed range and provide maximum starting torque. In closed loop vector mode, 0.01% speed regulation and 1000:1 control range can be achieved. Zero-servo capability provides position control at zero speed. The G7 drive has the world’s first 480V 3-Level Inverter architecture for total system protection. This patented 3-Level architecture can eliminate peripheral components typically required to solve installation problems sometimes encountered on 480 volt systems. The G7 allows motor operation at very long cable lengths, meeting NEMA MG1 Part 31, with peak voltage being 30% less than conventional. With motor bearing current being typically 50% less than standard inverters, the G7 provides four times the motor bearing life. Audible motor noise on the 480 volt G7 drive is 5-10 dB (20%) less than the prior generation drive, even when operating at half the carrier frequency. Common mode current is half that of conventional drives. The G7 power section includes built-in bus choke (most ratings), 12-pulse input capability (most ratings), common DC bus capability, and regeneration options. The G7 drive has three autotuning methods to optimize motor control, including the new static autotuning which does not require load decoupling nor motor rotation. The LCD operator displays 5 lines x 16 characters, in any of 7 languages. The keypad is intuitive and includes memory for parameter settings, making it easy to transfer settings from one drive to another. To further aid in parameter management, DriveWizard™ software for the PC is available at no charge, for upload, download, archiving, trending, and graphing. 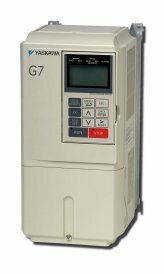 The G7 drive has a large programming feature set to handle sophisticated industrial applications. If the standard feature set does not meet your specific requirement, the G7 can be programmed using DriveWorksEZ™. This is a PC-based, object-oriented, graphical icon programming tool that is friendly to the user. The drive firmware can also be modified by custom or prewritten application-specific modules such as Motion Control or Electronic Lineshaft. The G7 drive supports the industry’s preference for open network architecture and connectivity with network choices such as DeviceNet, Profibus-DP, Ethernet, and others. The G7 is not intended for the simple, routine AC drive application, it is for the challenges. The G7 drive offers the ultimate performance, the best system protection, and the most flexible configurations of any drive available.